"Every main system is standing by and the final preparations are running smoothly," Xinhua reported. 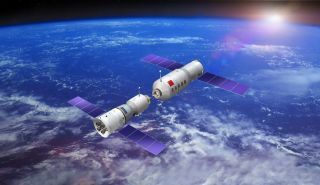 The 8.5-ton Tiangong-1 is slated to dock with the unmanned Shenzhou 8 spacecraft, which will launch at a later date. It will be the first docking between Chinese spacecraft, and will represent a significant step forward in the nation's space capabilities, experts have said. China is only the third country, after the Soviet Union and the United States, to launch a person to orbit. The first Chinese manned mission, Shenzhou 5, launched astronaut Yang Liwei in 2003. Two more manned missions followed, including a flight that featured the nation's first spacewalk in 2008.